In the collection of essays in the book under review, Sen is at his finest when slicing an idea, displaying a sleight of hand in posing the same question differently, much like a photographer who likes to first take a picture upfront from a commonplace view and then takes a few measured, deliberate steps and gives a picture of the same subject from a devastatingly precise and alternative angle. From looking into a pool of muddy water, the camera suddenly wafts towards the blue sky as it were. The brown disappears, and a clear azure reigns. The picture is,however, still deceptive ...the book is, ultimately not argumentative enough as it does not address three of the most pertinent contemporary contrarian ideas and ideologies- caste (Dalit upsurge), globalization and environment/ecology. The immediate motivation for writing this book, Amartya Sen explains at the outset, is to provide a ‘social and political understanding of India’ and restore the ‘long argumentative tradition in India’. Sen uses the word ‘argumentative’ interchageably (and somewhat ambigiously) in the sense of debate, critical thinking, heterodoxy and the dialectic, which he sees as a ‘powerful tool in resisting social inequalities and in removing poverty and deprivation’. 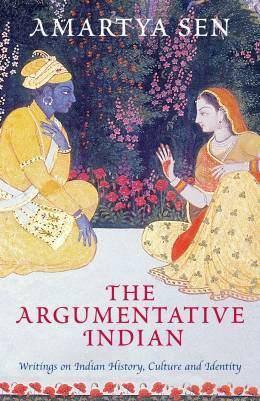 The selection of the word ‘argumentative’ in lieu of the many other words available is apparently a matter of ‘choice’ and Sen does not really address the question why he chose the particular term ‘argumentative’ and it takes at least a few pages before the reader can discern its usage in the intended sense. The collection of the 16 essays is divided into four sections with four essays in each. Between these four sections, Sen attempts to show the methodological and historical relevance of the dialogic and pluralism in the evolution of India. The first four essays attempt to restore the argumentative tradition in India by tracing its history. Similarly, Javali, a pundit, does not mere not treat Rama as God, but calls his actions ‘foolish’ (‘especially for’, as Javali puts it, ‘an intelligent and wise man’). Javali also explains that ‘there is no afterworld, not any religious practice for attaining that’, and that ‘the injunctions about the worship of gods, sacrifice, gifts and penance have been laid down in the sastras (scriptures) by clever people, just to rule over (other) people’. These provide the ground for Sen’s criticism of the syndicated Hinduism propagated by the BJP and its Hindutva allies. Sen goes on to illustrate the continuous tradition of heterodoxy and dissent n Indian history and notes that many of the heretical points of view during the middle ages came from the working class- like Kabir (weaver), Dadu (cotton carder), Ravi- dass (shoe- maker) and Sena (barber). There were a few women too, like Mira- bai, Andal, Sahajo- bai and Ksema. He follows this up, like Nehru, with the crucial and central role of Ashoka and Akbar in establishing pluralism. Sen quotes James Buchanan’s definition of democracy: ‘as “government by discussion” implies that individual values can and do change in the process of decision- making’. He underlines that the expression of values in a democracy also determines the values themselves, as illustrated by he very Indian form of secularism, sublimated according to him, in the championing of pluralism by none other than the Mughal emperor Akbar who organized debates and public dialogues between the followers of different religious faiths of his time (Hindus, Muslims, Christians, Parsees, Jains, Jews and even atheists). In the realm of science, Sen debunks the India of the popular Western imagination as a land of mysticism and religion. His excursions into Aryabhata’s works is particularly fascinating, he points to the fact that not only did Aryabhata at the young age of 23 publish his most important work explaining the lunar and solar eclipses in terms of the earth’s movement and but also indicated the very initial understanding of the phenomenon of gravity. He also drives home the gains of the only agnostic religion in the world and also the one that originated in India- Buddhism. He also comments that nearly all attempts at printing were undertaken by Buddhist technologists in an effort to expand public communication. The first ever printed book was the Chinese translation of an Indian Budhist work, whose introductory note explicitly explained that it was made for ‘universal free distribution’. Tagore’s criticism of patriotism is a persistent theme in his writings….’Patriotism cannot be our final spiritual shelter, my refuge is humanity. I will not buy glass for the price of diamonds, and I will never allow patriotism to triumph over humanity as long as I live’. The third section deals with contemporary politics and is certainly the weakest section in the collection. Sen recollects the promises made in Jawaharlal Nehru’s Tryst with Destiny speech, the issue of class and gender and the nuclearization in the sub- continent particularly after 1998. The final section has four essays that deal with the ‘Reach of Reason’, secularism and its discontents, India through its calendars and the question of the Indian identity. All of these, except ‘India through its Calendars’ fail to excite either because of the repetition in previous sections but also because Sen does not go beyond the mundane. Above all, in the last essay on the question of ‘The Indian identity’ where he assumes a very narrow meaning of the term ‘globalization’ in a very general sense as a movement or exchange of people and ideas across countries throughout history and hence concludes that globalization is a positive thing. While the intent of the professor is good, he does not place ‘globalization’ in the specific historical context of contemporary capitalism. Even in a social- cultural context, there is no indication of hegemonizing cultural overtones of triumphant Americanism after the fall of the Soviet Union. In the book under review, the author emerges as the quintessential liberal intellectual from the fifties. His world is populated by the categories of nationalism, secularism and nuclearization. The essays are erudite and persuasive and there are attempts at an understated humour as should be in any good essay though Sen is clearly not very comfortable in this zone. He is at his finest when slicing an idea, displaying a sleight of hand in posing the same question differently, much like a photographer who likes to first take a picture upfront from a commonplace view and then takes measured,deliberate steps and gives a picture of the same subject from a devastatingly precise and alternative angle. From looking into a pool of muddy water, the camera suddenly wafts towards the blue sky as it were. The brown disappears, and a clear azure reigns. The picture is still deceptive, however. One reason is that Sen tries to handle a certainly complex problem of what is India and Indian-ness not as an exercise in system building but rather as a series of intellectual skirmishes, each of which delight with their scintillating didactic forcefulness, but fall short in painting a more complete picture. He deals very well, for example, with the issues of Indian inclusiveness, its interactions on a global scale, specially with China in the first millennium, the modernizing ideas of Rabindranath Tagore, a thinker much ignored both in India and the West, the localized turf but the global influence in the cinema of Satyajit Ray and India’s rich tradition of heterodoxy and multi- culturalism to which he brings Ashoka’s and Akbar’s experiences to the front. But there is much that is missing in the collection of essays that seeks to deal with the heterodox, debating and hence ‘argumentative’ traditions in India. He does not attempt to understand, for example, why despite the thousand year long sway Buddhism (a very strong 'argumentative tradition' according to Sen), ultimately could not sustain. D.D. Kosambi had tried to explain the phenomenon in his The Decline of Buddhism in India in his equally stimulating collection of Exasperating Essays: Exercises in the Dialectical Method published almost half a century ago. On the contemporary scene, it is very interesting, for one, that Sen has practically nothing to say on the issue of Dalit identity and movements and there is complete nonchalance, apart from a few nodding asides, on the issue of caste oppression in India either in the past or the contemporary times. This reminds one of the Indian communist leadership that lamented the condition of the working class and the insulated and the humiliated, nevertheless ensuring that the leadership of the communist parties remained within the dominant castes. The same was true of the entire leadership of the Indian freedom struggle, apart from Ambedkar’s understandably vitriolic outbursts and Gandhiji’s paternalism towards the ‘Harijan’s as he termed the Dalits. Despite the caste question occupying a central place in the political discourse in contemporary India Sen seems to miss the evident. Similarly Sen is silent on the other central point of conflict in the last decade and half- that of globalization. In the last essay in this collection, he conveniently ignores the use of the term ‘globalization’ in contemporary discussions in the economic sense, not to say its use as an economic ideology of contemporary capitalism that has much in common with the globalization of a hundred years ago. Sen seems to consider any interchange of ideas between countries at all times in world history as the process of ‘globalization’, including, for example, the exchange of ideas between the Arab world and India about a thousand years ago. This is a very simplistic view of globalization. Nowhere does Sen consider the contradictory and debilitating impact of globalization in India in the past 15 years. Similarly, Sen does not have anything to say on the ecological and alternative movements in contemporary India. The book is ultimately not argumentative enough as it does not address some of the most important contrarian ideas and ideologies that have shaped contemporary India. This, however, is not to berate or understate his achievements. It is just that he has attempted something very big and with his reputation as an intellectual who is more than a dry economist, one perhaps expected something more. At the end of the book, Sen leaves the reader with a number of interesting facts and perspectives about India’s past and for a liberal of any hue, he leaves them with their convictions confirmed. Also hope you read Ram Guha's review of the book in EPW, Sen's response to that and my own letter on Sen's response. Aniruddha, I could not find the letter that you wrote at the EPW site. I did see Guha's review come up in the search results, but am not very keen to read it for now...thanks for the pointer all the same. This refers to Amartya Sen's "Our Past and Our Present" EPW dated November 25 2006. Ramachandra Guha's review of the Sen's book was as good as the book, if not better. It also perhaps was the only negative review of the book. Most foreign reviews of the book were rather effusive. They had nothing interesting or contrary or complementary to say. Reviews of Sen's "Identity and Violence" have been more interesting.For example, Fouad Ajami in Washington Post Book World had this to say: "Inspirational history can go only so far, it will not bend to Sen's good cheer". However, Sen's response turned out to be a damp squib. Sen has said nothing in the response which he has not said in either "The Argumentative Indian" or "Identity and Violence". I was ecstatic when I first read the book. And then I read Guha's review. Except one or two minor points, Guha's criticism of the book still stands. It taught me how first impressions can be misleading.